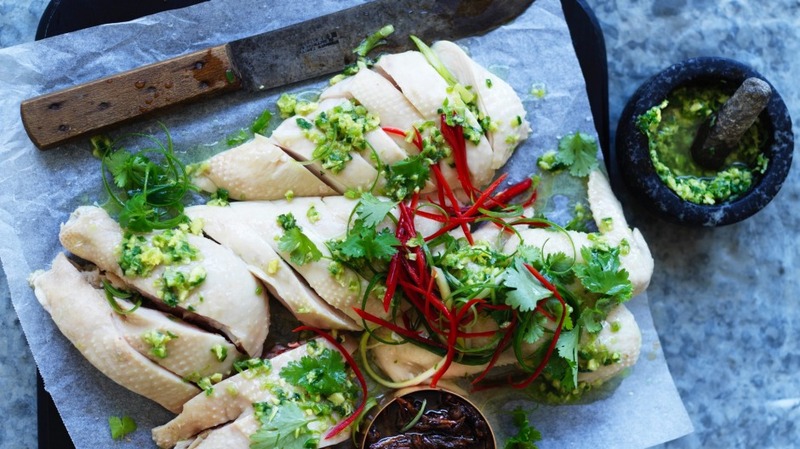 Poached chicken is one of the most useful recipes to have in your repertoire because it is versatile and is straightforward to make. Here's my step-by-step guide to portioning the bird, once it's been poached. 1. Place cooled chicken on a chopping board, breast side up. 2. With a sharp knife or cleaver, make an incision along the centre of the breast. 3. Using the heel of your hand, apply pressure to the top of your knife to chop through the breast bone. 4. Ease apart the two halves of the chicken with your hands and the knife. 5. Cut down one side of the backbone and separate the two breasts. 6. Cut off the wing from each breast and set aside. 7. Make an incision between the drumstick/thigh and the breast. 8. Cut bony pieces from the breast and discard. 9. Chop each drumstick/thigh into slices about 5cm x 2cm and arrange on platter. 10. Chop each breast across the bone into slices about 7cm x 2cm. Arrange on top of drumstick/thigh pieces. 11. Finally, cut each wing in half and arrange on top of chicken.